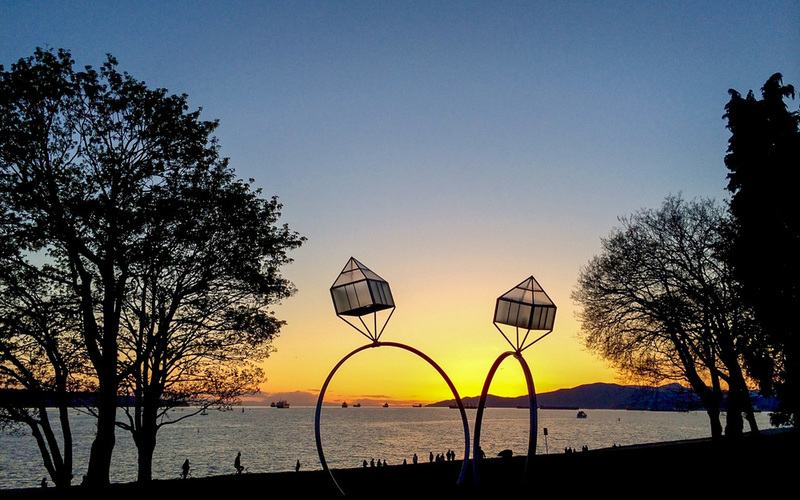 A romantic sunset along the sea wall at Sunset Beach, looking out toward English Bay. Photo by Johanna Read TravelEater.net. Vancouver, Canada’s biggest left coast city, is also Canada’s capital of social consciousness and outdoor activities. Surrounded by mountains and the sea, Vancouverites take their physical and social environments seriously. The socially conscious traveler can easily fill a weekend in the city where Greenpeace and Adbusters got their start. Dress code in Vancouver is casual. Vancouverites often dress as if they are ready to participate in an athletic activity at the drop of a hat (so much so that extras working in “Hollywood North” are constantly reminded that yoga pants and fleece jackets are not allowed on set!). The city is the birthplace of Lululemon and Arc’Teryx and there are plenty of opportunities to test out these athletic clothing brands outdoors and at more than 1,500 yoga classes each week (including atop a stand-up paddleboard!). You can do pretty much everything in Vancouver — how about a morning ski atop Grouse, Seymour or Cypress mountains, a kayak at lunch, and whale watching or snorkelling with seals in the afternoon? If you’re in to mountains and have more time, drive two hours north for a few days at Whistler-Blackcomb too. The resort is a regular winner of international ski and mountain biking awards, and has much to offer all levels of skill and intensity. Here’s a proposal for a mix of culture and athleticism for your Vancouver wayward weekend, with the opportunity to give back to the city’s less fortunate while you’re at it. Skwachàys Lodge Aboriginal Hotel and Gallery. On the edge of Vancouver’s hip Gastown neighbourhood, this boutique hotel provides you with a chic art-filled room, and channels 100% of its profits to social housing and the local indigenous community. Pronounced “skwatch-eyes,” Skwachàys Lodge is a boutique hotel, fair trade gallery, and an urban Aboriginal artist residence. The top three floors of the lodge have 18 hotel rooms, catering to both socially responsible travelers and indigenous patients from remote areas of Canada’s north who have had to come to Vancouver to receive specialized medical treatments not available at home. Six of Vancouver’s top hotel interior designers donated their services and teamed up with six local First Nations artists to produce each unique room. The rooms feature original carvings, paintings and textiles in designs you’re unlikely to find anywhere else in the world. How will you choose between suites with names like Earth, Sea Kingdom, Wilderness Teachings and Northern Lights? The hotel is owned and operated by the Vancouver Native Housing Society. The Society also provides 24 shelter-rate apartments for indigenous people who are at risk of homelessness, and houses two social enterprises helping to support it. Once you’ve settled into your suite and peeked in to have a look at the rooftop sweat lodge, you’re likely in need of a pick-me-up. Prolong falling into your Hypnos bed (the Royal Family’s bedmaker) with a coffee from the neighbourhood. 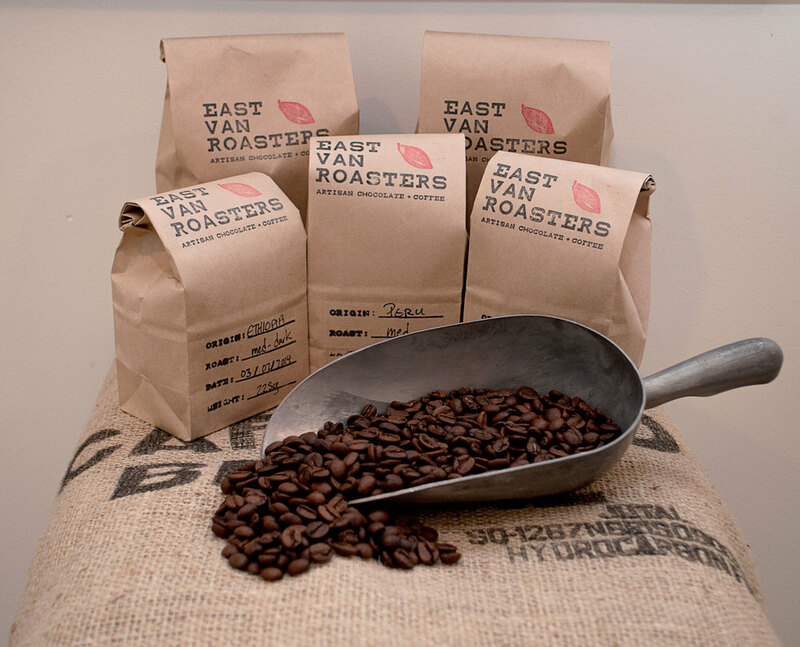 East Van Roasters is an artisan chocolate and coffee shop of exceptional quality. Organic fair-trade and direct-trade coffee and cacao beans are roasted on site, and hand-processed into decadence. You can enjoy drinking chocolate, espresso and French press beverages, single-origin chocolate bars, hand-rolled truffles and divine pastries. Vancouver’s top chefs source their chocolate here too. The shop is a social enterprise run by the PHS Community Services Society, a key social services provider for Vancouver’s Downtown Eastside. East Van Roasters provides employment and training opportunities for the female residents of Rainier Hotel, many of whom are in treatment for addiction and are transitioning from homelessness. Still feeling tired after your travels? Take a short walk downtown to Canada Place. Here you can experience FlyOver Canada, a flight simulation ride / movie which will invigorate you with the experience of flying all the way across Canada’s stunning landscape, without any aviation carbon emissions. Fly through the mists of Niagara Falls, above whitewater kayakers, through Canada’s biggest city, and even smell the scents of prairie and forest. In Vancouver it is fairly standard for restaurants to use local and seasonal ingredients, as well as Vancouver Aquarium-approved Ocean Wise seafood. You’ll have a lot of socially-conscious eateries to choose from. An easy walk from Skwachàys Lodge, Nicli’s Next Door is a good choice for your first night’s dinner. The restaurant cultivates relationships with local farmers, and integrates the region’s bounty into an ever-changing Italian-inspired menu. Curious about the “next door” part? Next door is the original Nicli Antica Pizzeria, which serves VPN-certified Neapolitan pizza and the best arugula salad you’ve ever tasted. While Skwachàys Lodge includes a grab-and-go breakfast in their rates, you might want to pocket it for a mid-morning snack and start with something more substantial. After you’re fueled, a walk on the sea wall is a must for any visit to Vancouver. From Gastown, you have two choices of direction. Closest is to head north to the Coal Harbour waterfront and then walk westward for a counter-clockwise stroll around Stanley Park. Once in the park — Canada’s urban rainforest — take your photo at the totem poles on your way to the Vancouver Aquarium. The Aquarium is a non-profit society dedicated to the conservation of aquatic life. Vancouver Aquarium was the first aquarium in the world (in 1996) to make a commitment to no longer capturing whales and dolphins from the wild. Learn how the Aquarium’s Pacific white-sided dolphins — who were rescued from fishing nets in Japan — are helping researchers understand how dolphins perceive nets, with the hopes of developing dolphin-safe fishing nets. The Aquarium also cares for other mammals who are unable to live in the wild, such as a beluga whale captured in 1990 from Churchill, Manitoba and her baby, the first beluga conceived and born in a Canadian aquarium. Your heart will be warmed with the story of the rehabilitation of Chester, a false killer whale found stranded on a beach in 2014 with only an estimated 10% chance of survival. A favourite Aquarium tradition is the Thanksgiving weekend release of rehabilitated seal pups back to the wild by the Aquarium’s Marine Mammal Rescue Centre. In the summer of 2015, the Aquarium cared for 129 rescued seal pups and about half were returned back to the Pacific Ocean within a few months of their rescue. If you can leave behind the beauty of the Aquarium (I can lose track of time watching the colourful jellyfish), there’s lots more to do. Walk all the way around Stanley Park to English Bay (or, if you’re pressed for time, take a shortcut back through the city to get to the False Creek side of downtown). All along the sea wall, you’ll find wild blackberry bushes (you’ll have to get lucky to find ripe ones that haven’t already been snacked upon by early risers). You might see raccoons in the bushes too; they’re cute to look at, but they can be vicious. Keep your distance. It will be difficult to keep your eyes off the beautiful water views. 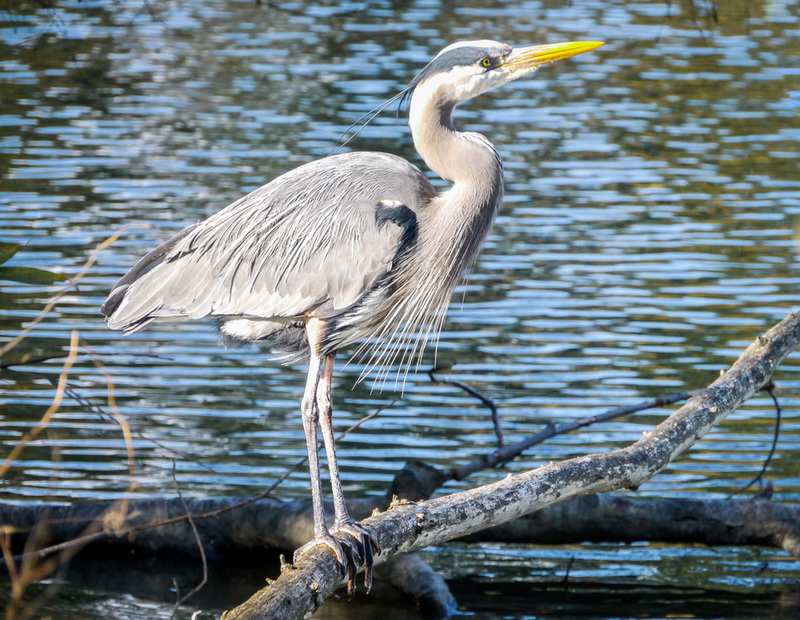 It’s common to see great blue herons fishing ankle deep in the waves (they nest near the Stanley Park tennis courts) and harbour seals are frequent visitors. Occasionally orca and grey whales come close to shore too, delighting locals and tourists alike. When you’re starting to feel hungry, take a tiny passenger ferry (either the Aquabus or False Creek Ferries) from various docks on the False Creek side over to Granville Island. The best place for a sit-down lunch is Edible Canada. They’re a culinary tourism company focused solely on highlighting Canadian cuisine and promoting local foods. The bistro’s menu changes often with whatever is freshest, and their salads are always beautiful. Ocean Wise and gluten-free fish & chips are a menu constant and local favourite. Pick up gifts and supplies for your own kitchen in their shop. Don’t miss Noble handcrafted and bourbon barrel-aged maple syrup — you’ll not find a better tasting syrup. Spend the afternoon wandering the Island’s shops, checking out the exhibits, performers and ateliers of artists and artisans. When you’re ready to head home, head to the public market to stock up on local produce and products for a midnight snack and tomorrow’s breakfast. In late-July and August, BC’s cherries are the best in the world, and the peaches, nectarines, apples, and berries will make every fruitavore ecstatic. Terra Breads is the best source for pastries and makes an authentic baguette, perfect for munching on with your expertly selected cheese from Benton Brothers (highly recommended: chèvre noir and grey owl, both from Quebec, and Smits & Co.w’s jalapeno goat cheese, from a family-run farm just outside of Vancouver). For dinner, try something unique. Vancouver’s only First Nations restaurant is Salmon n’ Bannock. They use traditional ingredients, like Ojibway wild rice, free-range bison and elk, and wild fish, in modern ways. There are a few traditional dishes too — everyone needs to try Indian Candy (candied, smoked wild salmon) and bannock (unleavened bread). You can walk directly from Granville Island, or take a cab if you’re leaving from the hotel. You were tempted at Terra Breads and Granville Island’s public market, so you likely have more than enough to start your day between the hotel’s breakfast and the treats you bought yesterday. If not, Trees Organic Coffee and Roasting House in Gastown will surely satisfy. After last night’s dinner, you’ll want to learn more about Vancouver’s First Nations’ heritage. Indoor options include the University of British Columbia Museum of Anthropology and downtown’s Bill Reid Gallery of Northwest Coast Art. If you’d like to stay outdoors, consider Talaysay Tours’ Talking Trees Tour in Stanley Park, or take the free shuttle bus to the Capilano Suspension Bridge on Vancouver’s north shore. Here you’ll find North America’s largest private collection of totem poles, learn about local First Nations history, and understand the gifts of the west coast’s rainforest. Unless you’re afraid of heights, you’ll love crossing the wobbly bridge, teetering along the cliff walk and the treetop adventure where you can walk 100 feet in the air from the “mid-story” of 1,300-year-old Douglas firs. You’ll just have time to stop at Tractor Everyday Healthy Foods for some veggie-friendly sandwiches, soups and salads before you pick up your bags at Skwachàys and then Skytrain it back to the airport. From Kits Pool you can admire Kits Beach, False Creek, the sea wall and even the snow up on Grouse Mountain. Photo by Johanna Read TravelEater.net. Skytrax World Airport Awards has named Vancouver’s airport (YVR) North America’s number one airport for five consecutive years, and it is the only North American airport included in the top ten. YVR will connect you to anywhere in the world. The Canada Line (follow the signs in the airport) connects YVR to most parts of Vancouver. Buy a Compass Card and you can avoid traffic with a quick rail journey downtown. If you’re travelling light, you can walk from the terminus station, Waterfront, right to Skwachàys Lodge; otherwise there should be plenty of taxis waiting outside Waterfront to take you right to their door. Vancouver is known as Rain City, and there is often rain in the forecast. Vancouverites don’t want the rest of Canada to know that much of this rain falls overnight (otherwise everyone would want to live here!). Bring a rainproof jacket just in case though. Being on the ocean means the climate is fairly temperate year round. Summers are sunny and dry with temps around 25 Celsius (77 Fahrenheit). Christmas and early-January are coldest, with a few weeks hovering near freezing. Snow at sea level is extremely rare, but you’ll see it in Vancouver’s suburbs, especially on North and West Van’s mountain-slopes. Despite the winter chill, you’ll find flowers in bloom every month of the year in this outdoor friendly city. Editor's note: The writer was hosted by the hotel and Vancouver Tourism provided complimentary access to some of the activities listed. All opinions are the writer's own and no one from these organizations reviewed or approved the article. A socially conscious travel guide to a weekend discovering the temples of Angkor Wat and Siem Reap.